Like San Jose last week, once again we saw how the Galaxy’s Y-midfield can be easily shut down and countered, and it’s a worrying trend. 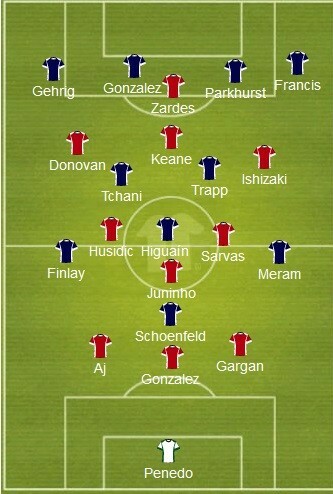 In theory, as long as Sarvas and Ishizaki are advanced, and the ball is circulating well, Trapp will be forced to cover Ishizaki, and Tchani will be forced to cover Sarvas, leaving an inverted Donovan, a withdrawn Keane, and an overlapping Rogers 3 on 2 against Gehrig and Gonzalez. This system works the exact same when shifted to the right — with Tchani on Donovan and Trapp on Sarvas, leaving Ishizaki, Gargan, and Zardes against Francis and Parkhurst. Against Portland, LA had three distinct areas of chance creation around the box. Here is a diagram of chance creation versus Portland, which each point circled. By getting to the top of the box, Marcelo Sarvas pulled a center mid with him and prevented that CM from shifting over to properly defend Donovan and Rogers on the left. Against Portland, it worked like a charm. 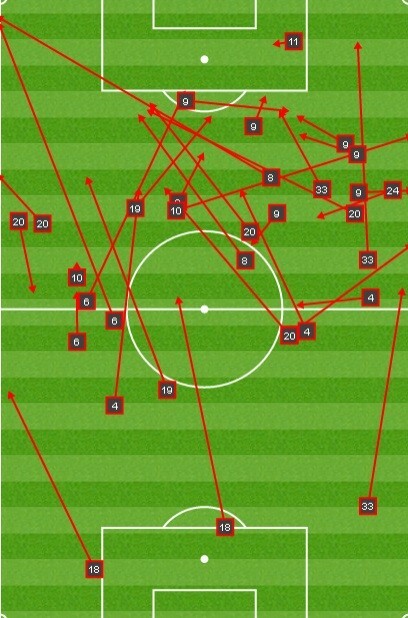 And here, I think, LA’s new Y-formation – which managed 7 goals in its first 3 games – has been exposed. If you prevent Marcelo Sarvas from finding space going forward, even if it means giving Ishizaki more space, LA’s Y-formation becomes little more than an empty bucket. The wings are isolated. Donovan finds himself having to sit centrally, rather than angling centrally (big difference), and chance creation suffers. And given that the Galaxy send 7 players forward into the attack, this leaves the formation incredibly vulnerable to the counter. If you refer back to the formation chart I provided at the beginning of the article, you will notice that when the Galaxy are in their advanced position in the attack, Juninho is isolated against the best playmaker in the league. 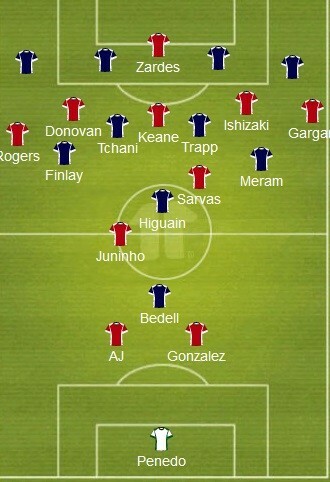 Also noteworthy is the plentiful space that Finlay and Meram have in front of them. 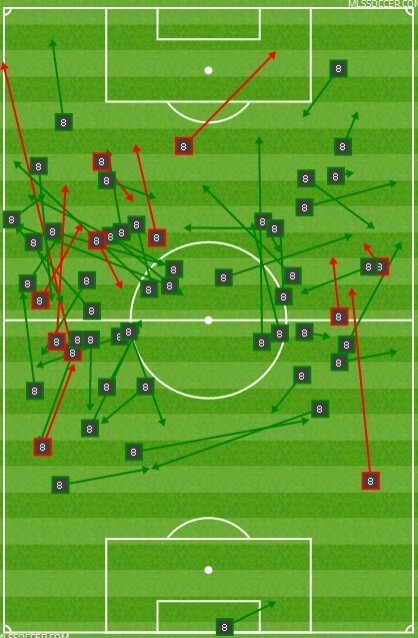 Here is a basic visualization of how Federico Higuaín was able to unlock the Galaxy defense time and time again. As soon as the ball was turned over, the ball would immediately be fed to Higuaín, who would, in turn, feed the ball to either Finlay or Meram, who had acres of space to work with. 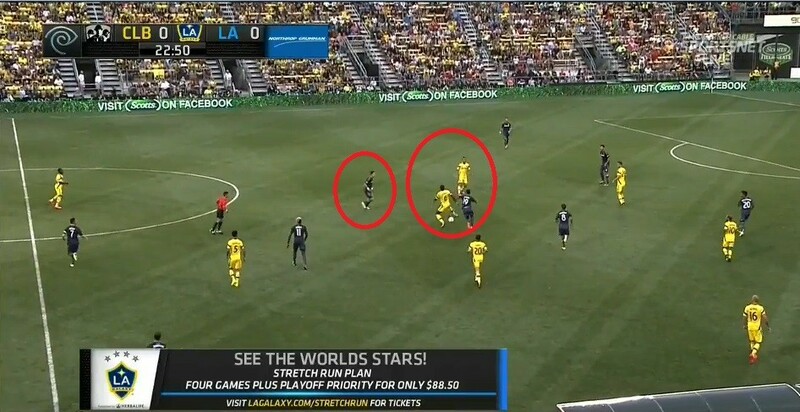 The Columbus goals prior to the Galaxy’s shift to the 3-4-3 were also the result of defensive sloppiness. In the build-up to the first goal, Stefan Ishizaki is caught out of position when a Galaxy throw in is recovered by Columbus. I’ll give Stefan a pass on this, but what happens next is completely inexcusable on the part of Marcelo Sarvas, and it’s not something I can show you in a single image. In short, he dogs it. He gives up on trying to make the recovery, and when the ball is unexpectedly cut back into a position where he can make a tackle — he isn’t ready. He’d already given up on it. Watch for yourself, and keep a close eye on number eight. Simply inexcusable. The second Columbus goal is just a very poor read by Omar caused by the less than stellar job Juninho and Gargan do of closing down the man with the ball. When the play starts, the Galaxy are positioned well to defend it. But very similarly to the Wondolowski goal in the previous week’s game against San Jose, Omar makes the poor decision of stepping to the ball, allowing his man to run in unmarked. Despite all of this, the Galaxy managed to pull a goal back and went into halftime only down by a goal. In the second half, however, a series of very poor coaching decisions led to a complete and utter collapse. Here is how it all went down. The second half got off to a surprisingly good start as the Galaxy made the following tweak to the system. Robbie Keane dropped back deeper, taking the pressure off Sarvas from providing attacking pressure around the top of the box. This, in turn, allowed him to sit back more and help Juninho break up those counters. From an offensive standpoint, as long as the Galaxy could transition quickly and get in behind Finlay and Meram, they could once again work their magic in those centerback/fullback channels. The Galaxy began to find their rhythm and it seemed like it was only a matter of time before an equalizer. Twenty minutes into the second half, however, Robbie Rogers goes down with an injury, and Bruce responds with a series of ill-conceived tweaks. 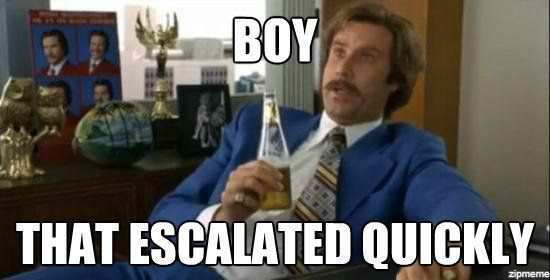 65th Minute. Bruce subs in Baggio Husidic, and the Galaxy switch to three in the back. This shift in tactics had the following easily foreseeable results. 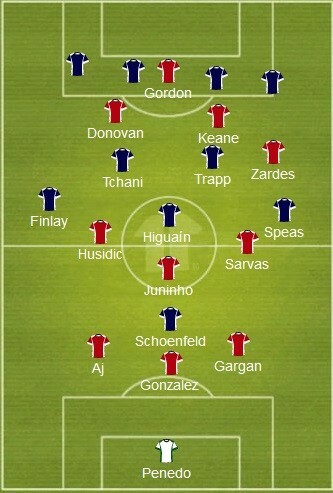 For one, the progress made with the smart halftime change of dropping Keane back to allow Sarvas to sit back more to help out Juninho on Higuain, was completely undone. Sarvas was now responsible for helping to cover the right hand side and helping Gargan. Obviously, one could argue that Ishizaki shouldn’t have pushed up so high, but as a manager, Bruce should know the tendencies of his players. Ishizaki will always push high. The second problem was that it completely sacrificed the width of the formation. 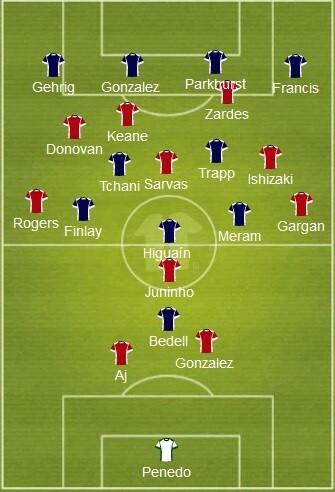 Given the proven fluidity of Donovan, Keane, and Ishizaki, this wouldn’t have been that much of a hindrance — just a major shift in how the attack would go about creating chances. But then, in the 70th minute, Bruce made a further adjustment to the system. An adjustment that kinda suggests that Bruce really had no clue what the system was. 70th minute: Bruce, like a kid eager to play with a new toy, sends on Alan Gordon for Stefan Ishizaki. Now the reason I am being so hard on Bruce for this is because we spent the final 30 minutes of the game in a formation that makes absolutely no sense. Have a look for yourself. By subbing in Gordon and putting Zardes in Ishizaki’s place, Bruce essentially exacerbated the problem of playing a 3-4-3 with a right mid that likes to push into attacking formations, by swapping him with Gyasi Zardes — a forward who will get forward even more than Ishizaki. It did not take long for this 3-3-4 system to blow up in Bruce’s face. Five minutes later, Speas scores a goal down that side. But the problem with this formation isn’t just the obvious defensive holes. It’s the poorly envisioned, if envisioned at all, way the Galaxy midfielders were supposed to go about getting the ball to the 4 forwards. In Tchani and Trapp, the Crew have two midfield disruptors. Playing three center mids and no full backs against a system that is built from the spine is just flat out dumb. Columbus was giving up all kinds of space on the wings, and LA had no way to exploit it. 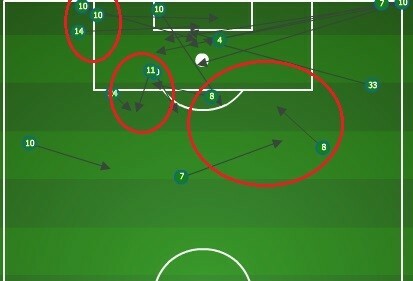 Without a means to move the ball down the flanks, Alan Gordon’s usefulness as a target forward was limited to simply heading down boom-balls. And that’s what LA did for the final third of the the game. They launched a ton of low percentage boom-balls in the hopes that Gordon might, by chance, knock one down to Keane or Donovan or Zardes in an opportune place for a shot. And every time the Galaxy turned the ball over on these hopeful attempts, the Crew would speed down the flanks and tear our back three to shreds. In all my years of watching soccer, I have never seen a coach hurt his team so much by way of his subs. This was a coaching blunder of the highest order, and effectively took LA out of the game. The following tactical blunders are flat out egregious. 1. Bringing in a target forward after subbing out the wings. 2. Attempting to play a 3-4-3 using an inverted right wing, Ishizaki, or a converted forward, Gyasi. Now, Bruce is an experienced coach. A coach I often criticize for being overly conservative and slow to keep up with the ever changing game, but a good coach none the less. I choose to believe that Bruce was simply thrown off his game when Robbie went down. With new pieces on the bench, he didn’t have a contingency plan, and thus his subs made little tactical sense. I think Bruce will take a look at this film and recognize the error of his ways, and I do not expect this to happen again. The larger concern, however, is the recent collapse of the current attacking system. With the new formation crumbling before our eyes, its flaws laid bare for all to see, Bruce Arena needs to act. He needs to tweak. A switch back to the diamond, with Donovan at left mid? A system where Robbie Keane drops back more to be a playmaker? Who knows? Whatever he does, he must to do something if the Galaxy are to remain in the race for the Supporters Shield. It’s not acceptable to sit around and blame these last two performances on bad luck, poor officiating, or poor individual performances, as he has done. Soccer is dynamic — an ever-changing sport where adaptation is key, and complacency and regression are one in the same. To Bruce’s credit, this has been a year where he has shown an uncharacteristic readiness to tweak, and for all the hardships along the way, we have no doubt learned a lot about our team a long the way, and are still well-positioned to make a run at the Supporters Shield and MLS Cup. Can Bruce right the ship again?